Ansonia Crystal Regulator, "PRISM" Model, c. 1891 with the optional Jeweled Sash and Pendulum. Case:Brass and Beveled glass. 10.75" tall. 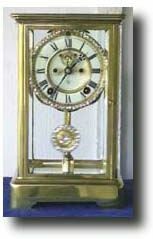 Works:Ansonia 8 day time and strike on gong.. Reference: Ansonia Clocks by Tran Duy Ly Condition: Case: excellent; Works: excellent.